One of the most commonly spotted birds of Bermuda is the Eastern Bluebird. Blue in color and small in stature, bluebirds are expert nest builders and territorial when it comes to protecting their homes. Here are 5 other facts about bluebirds you probably don’t already know. 1. While they mostly feed on small insects like caterpillars, beetles, crickets, grasshoppers and spiders or on fruits like honeysuckle, mulberries and cedar berries, Easter Bluebirds have been known to eat lizards and tree frogs. 2. Eastern Bluebirds build their nests in natural cavities such as old woodpecker holes in dead pine or oak trees but some use nest boxes too. 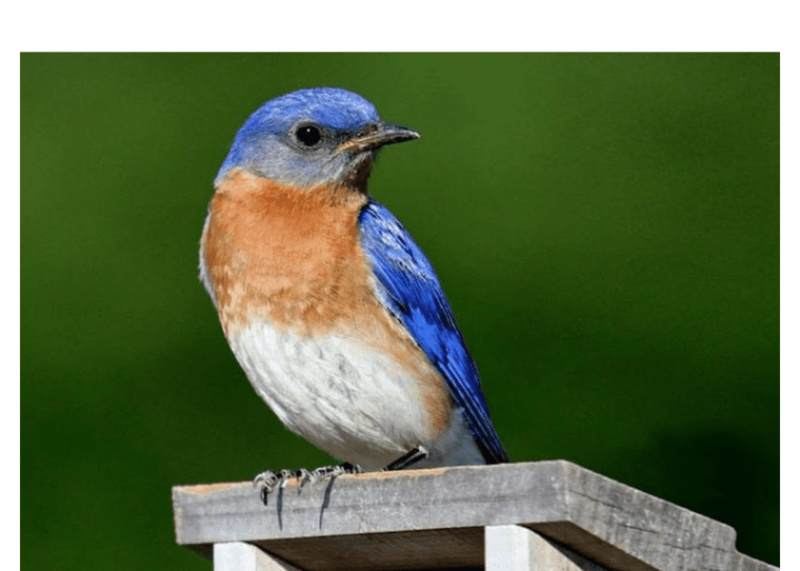 Older bluebirds are more likely than younger ones to nest in a nest box, although individual birds often switch their preferences between nesting attempts. When given the choice in one study, bluebirds seemed to prefer snugger nest boxes (4 inches square instead of 6 inches square on the bottom) with slightly larger entrance holes (1.75 inch rather than 1.4 inch diameter). 3. The male bluebird attracts the female bluebird to his nest site by carrying material in and out of the hole and perching, and fluttering his wings. Once the female has been attracted, she does all the nest building! She makes the nest by loosely weaving together grasses and pine needles, then lining it with fine grasses and occasionally horse hair or turkey feathers. Nest boxes in some places are so common that a single territory may contain several suitable holes. Females often build nests in each available hole, but typically only use one of these. Bluebirds may use the same nest for multiple broods. 4. Bluebirds forage by fluttering to the ground to grab an insect, or occasionally by catching an insect in midair. Bluebirds can sight their tiny prey items from 60 feet or more away. They fly fairly low to the ground, and with a fast but irregular pattern to their wingbeats. Males vying over territories chase each other at high speed, sometimes grappling with their feet, pulling at feathers with their beaks, and hitting with their wings. 5. Males vying over territories chase each other at high speed, sometimes grappling with their feet, pulling at feathers with their beaks, and hitting with their wings. The boxes and tree cavities where bluebirds nest are a hot commodity among birds that require holes for nesting, and male bluebirds will attack other species they deem a threat, including sparrows and starlings.